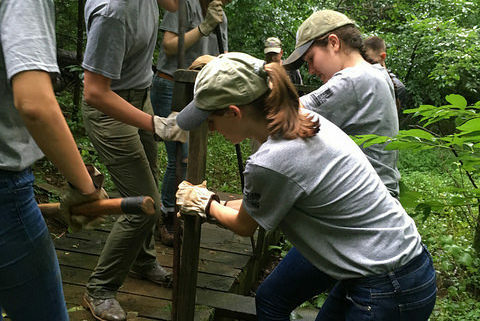 Virginia State Parks Youth Conservation Corps (YCC) is now accepting applications for the 2019 Crewmember position (available to youth both residents and non-residents of Virginia). During YCC you rise with the sun everyday as you persevere daily seeking new adventures, hard work, and unforgettable memories at Virginia State Parks. Choosing an experience with the YCC has a unique way of shifting the way you view the world around you. Three weeks with the YCC is an opportunity to relinquish social media and texting and a time to focus on nature, real relationships, character building and fun! The YCC seeks ambitious youth, ages 14-17, to serve on a crew with nine fellow crew members. Crews are led by three adult crew leaders who guide crew members through day to day operations and decision making. Crew members will find a million little things to be discovered, admired and appreciated; from the quiet beauty of a bonfire to the time spent constructing a new project; youth should be willing to actively participate in all activities and are expected to work diligently on service projects as one cohesive team. While the YCC may be a ton of fun it is not a summer camp, crew members are expected to complete many laborious tasks immersing members in a world unlike anything they are used to. It takes away a few modern comforts and conveniences and replaces them with hard work and friendship. Youth learn the value of a one-on-one conversation with a trusted friend, a job well done and all the natural beauty that surrounds them. While in the park, the crew will work on various projects such as trail maintenance, construction of new park facilities, and park beautification. Work can be difficult but it is also extremely rewarding for crewmembers to see the projects they are able to complete during their time with the YCC. Learn more, or if you have any questions just email the staff here.